Today during mid-afternoon, a wildfire broke out on property that neighbors the UC Hopland Research & Extension Center. Fortunate for HREC, the day was overcast and "muggy" and there was no wind. 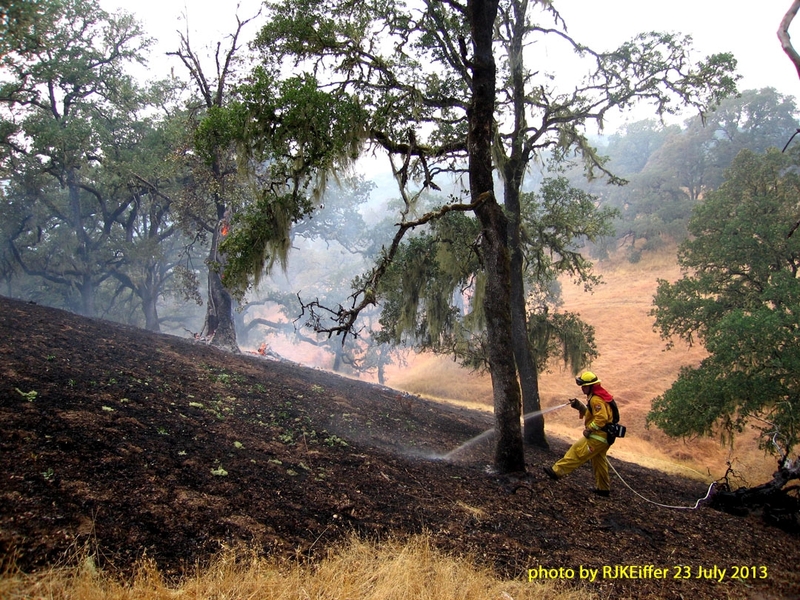 CalFire and the local Hopland Fire Department crews were able to respond quickly and kept the fire to about 45 acres. Only 3 or 4 acres were scorched on HREC property ... all in blue oak savannah vegetation. The fire response team was able to quickly access UC property by cutting a fence to gain access to one of HREC's remote dry-season pasture roads. From an ecological point of view, I have to give great credits to CalFire for limiting soil disturbance to the site. Even though a dozer was dispatched onto the property, the operator did not drop the blade except where absolutely necessary. In past decades, indiscriminate dozer-blading for fire breaks and trails took decades to halt and heal the enhanced erosion. The HREC Lake Pasture pond was extremely useful in controlling the fire as it was the closest source of water for the helicopter buckets.